With a stylish, international population, 300 days of sunshine and a rich heritage, Aix-en-Provence is a refined town drenched in sunlight and culture. 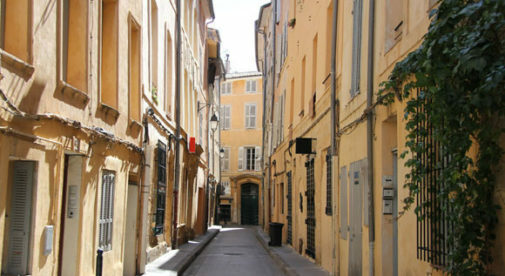 Full of surprises and delights, Aix celebrates its history yet evolves with the times. It’s a place where you can watch a bullfight in the afternoon and a 3D film in the evening. A place where you learn how to appreciate the simple things in life. Aix is the capital of a visually stunning region in Southern France known as Provence. Lush with golden sunflower beds, aromatic lavender fields, ancient olive trees, legendary grape vines and rolling mountains, Provence has long been sought after by people looking for the good life. Its size and location make Aix a lovely place to call home. The historic center has winding cobblestone roads designed before there were cars, so walking is the preferred means of transportation. Instead of having to navigate noisy boulevards, you’ll wander through charming pedestrian squares with outside cafes, making it easier to meet people. The 160,000 residents of Aix are a mélange of French and internationals with a steady flow of students and visitors adding to the mix. This cosmopolitan population creates a dynamic atmosphere where you can always find someone who speaks English. Outside of Aix there is a lot to discover. In less than two hours you can have long lunches in the Luberon, visit charming hill-top medieval villages, ski in Gap, climb Cezanne’s St. Victoire, explore Roman ruins in Arles, experience wilderness in the Camargue, sail the dramatic coastline near Marseille, or drive along the glitzy Cote D’Azur. In Aix, sipping coffee in an outside café and enjoying meals are prolonged, honored activities. It is customary to stop what you are doing between noon and 2.00 p.m. and have a proper lunch. Stuffing a sandwich into your mouth on the go will not suffice. Whether at home or in a restaurant, meals are taken seriously and usually include a warm dish prepared from fresh ingredients, a glass of wine, coffee and a small dessert. Served in manageable portions at a very leisurely pace, French-style dining provides ample time to enjoy the company of others and take a sufficient break from the day. Aix pays homage to Old-World values such as shopping from true artisans. Instead of big stores with everything under one roof, you find the opposite: specialty shops, often only retailing one type of product. Next to an artisanal candy shop you might find a store selling only iPod cases. Moreover, every morning the main square swells with market stalls presenting the region’s freshest fruits, vegetables, flowers, meats, and more. These “pop up stores” create a colorful collage of the local harvest that looks amazing and tastes extraordinary. Smooth, creamy goat’s cheeses, cherry tomatoes that pop like a burst of sunshine in your mouth—these are things I never thought twice about before, but now can’t live without. Indeed, Aix is one of the few places in the world that has avoided an invasion of big corporations. Instead of Walmart or Starbucks, you’ll find local butchers, boutique hotels and family-run pastry shops. Supporting these businesses means that traditional crafts such as cheese-making and olive oil production will continue even as new ones develop. This is the beauty and irony of Aix—how it delicately yet effectively marries its history with its future. You can get all the same items here that you can in North America…but the experience is completely different. Aix is much more than a just a great place to live as an expat. It’s a great place to discover what’s important in life. In Aix, it is remarkably easy to shed the superficial, reduce the stresses of modern day living and maintain a healthy, culturally rich lifestyle.